Made by the talented team over at Customized Communications (CCI), The Gift of Motherhood provides future mothers a comprehensive guide through the experience of pregnancy, labor, postpartum and newborn care. What made the app so successful was the level of interactivity that the creators injected into it, using 3D videos and a weekly baby development calendar to create an engaging and educational experience, and an instant mobile tool for future moms. Perhaps one of the most impressive features about The Gift of Motherhood was that the CCI team had zero experience building mobile apps or programming prior to the app project. They already had the content; CCI has been a leader in providing resources to mothers for many years, and just needed to convert their material into a compelling mobile app. 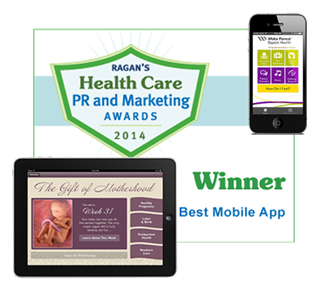 Using the code-free, native app capabilities of the MobileSmith app development platform, the CCI team was able to design, develop, test and deploy this 2014 Ragan Awards winner in just six months. They are not the only success story this year. Wake Forest Baptist Health’s Comprehensive Cancer Center also joined the ranks of multiple award-winners this year. One of the elite hospital systems, and top cancer facilities in the nation, WFBH delivered a companion app for their oncology patients. The app, which won a WebHealth Silver Award and a Communicator Award of Distinction, allows users to track appointments and medications, connect with their providers, and even try on virtual wigs. Comprehensive Cancer Center is just one of the apps created by the team at WFBH, also eschewing the cost of outside developers and creating outstanding apps for their patients. Are the 2014 Ragan Awards Just the Start? CCI’s The Gift of Motherhood achieved their success by providing a comprehensive, instant mobile resource for prospective mothers. WFBH’s Comprehensive Cancer Center triumphed as a companion app for oncology patients to streamline care and provide needed entertainment. Both apps found a code-free platform, allowing them to quickly create innovative and practical applications that met their mobile needs and won multiple awards in the process. The MobileSmith platform has been used by many a client to create apps that took home the hardware, including The Gift of Motherhood, Comprehensive Cancer Center and Henry County Health Center’s HCHC Healthy Living. The power to turn your needed information and great idea into an award-winning mobile app is at your fingertips. Take some lessons from great apps, like the 2014 Ragan Awards winner, and you can get some red carpet time for your own app.